Arthritis which once upon a time was only common among elderly people in society has also become a very common issue among elderly animals like dogs. When dogs get older they tend to sleep more, rather than playing with their favourite toys they ope for the bed instead, people take them as lazy and old. However, if we observe the symptoms closely then we might find it the case of arthritis. 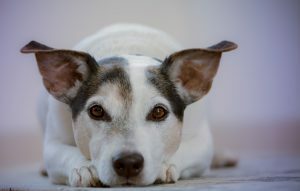 Before moving further about the basic symptoms or cures for Arthritis in elderly dogs, let’s first understand the issue first. Arthritis in Dogs – Why and Where? As we already know that arthritis can be of several types which can affect the dog’s bones and body. However, the most common form known is osteoarthritis. Osteoarthritis is also recognised as a Degenerative Joint disease among the dogs. In this condition, the joints of the Dog’s body are affected especially joints at elbows, hips, wrists, ankles, knees, shoulders, and lower back. In the recent study, it is found that one out of five dogs is affected by the condition. Apart from old age, old injuries, obesity as well as metabolic disorders including diabetes can be the factor in developing this condition. It is believed that during the process of ageing the cartilage in the dog’s bones tends to thin, because of which the cushion between the bones decreases. This eventually leads to rubbing of the bones. Rubbing of bones will not only be a painful part but will also lead to breaking of bones at a higher rate. When there is a medical condition then there are symptoms as well. However, in the case of Osteoarthritis, these symptoms are hard to find at an early age. The problem is seen only when the damage is severely done and the joints have moved or the bones are poking out in an abnormal fashion. It is also believed that dogs don’t show the level of discomfort they are feeling. Still, here are some symptoms of Osteoarthritis in Dogs which can help in detecting the issue at the early stage and can be cured in a better manner. Avoid basic movements like running, exercise or stairs. As these movements require moving joints. Getting lazy with every passing day. Tends to stay in instead of playing. Sleeping is their new hobby. Gets tired easily. Is not a dog anymore- meaning the dog don’t like to jump like they normally used to do while going in the car or getting comfortable on the sofa. There is a limp when they walk or do not move with normal ease. Gaining more weight or getting more moody about their food. Simple personality changes- not friendly anymore, depressed, grouchy, etc. These symptoms can only be seen if you observe closely, plus these symptoms can lead to some other issue as well. Hence it will be better if you take your dog to check- up if there are even simple changes in their behaviour. Some of the treatments for the people facing osteoarthritis are also available for the dogs. The main purpose of these treatments is to provide relief to the dogs from the pain and help in increasing their function as well as movement. Experts say that if there is a possibility then they also try to repair the cartilage as well as slowing the process of degeneration. Medical Drugs: There are several kinds of medical drugs in the market which helps in pain as well as inflammation. These anti-inflammation drugs along with Cortisone or steroids are good for short term but are quite harmful for the long-term use as they tend to leave side effects on the dog’s body. For a natural anti-inflammatory, try turmeric there have been some significant results with turmeric for dogs that suffer from arthritis also has many other health benefits. Some of the vet experts are also practising for surgeries to help the dogs. These surgeries replace the joints with the artificial one. Exercises: Physiotherapy or proper exercises along with weight management can also slow down the damaging process in the dogs. More the weight more the pressure on the joints. Hence managing the weight can help in keeping the pain to a minimum. Therapies: From acupuncture to ayurvedic treatment, there are several therapies’ options available if you want to treat the dog in a different manner. Here the vets make the healing process less painful and more beneficial.